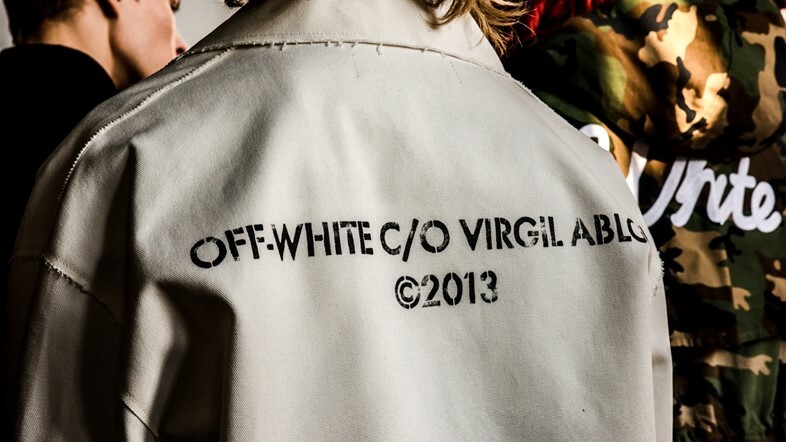 “I look at my job, or mission, or passion, as defining streetwear,” remarks Virgil Abloh. “It’s a term that I always say could end up like disco if not handled well... I’m trying to see how far I can push it.” He pauses and steps away to snap a picture of a model in a tailored Off-White coat who’s about to be shot for his label’s AW16 lookbook. Rails upon rails of samples surround us, the room packed with stylists, make-up artists, photography equipment and a slew of people with no apparent role. In short, it’s a scene of chaos. “This is my version of working a desk job,” he smiles. We retire to an office crammed with boxes, which feels utterly serene in comparison to next door. 24 hours earlier, Abloh took his first bow as a designer at Paris Men’s Fashion Week, displaying a collection that merged his unique street sensibility with undulating overcoats and refined elements of tailoring. Set on an industrial orange runway, with a youthful, unisex cast, it was an accomplished display for someone who is still very much regarded as a newcomer by the world of fashion. Entitled “Don’t Cut Me Off,” the collection was undoubtedly a triumph for Abloh and Off-White; although there were elements that referenced past collections, this was a far more ambitious proposal than anything he had previously shown. Spliced, oversized car coats sat alongside exaggerated printed bomber jackets, which were a far cry from the screen-printed t-shirts that many believe define his work. Those who turned out to support Abloh also reflected the unique position that he occupies within his field. His bow at the end was hijacked by Ian Connor – the stylist and creative director of A$AP Rocky who embodies the brash youthfulness of streetwear. Meanwhile, Balmain’s Olivier Rousteing watched on, embracing the designer at the end of the show. It was an unusual coming together of seemingly disparate fashion worlds, but then again, Off-White has always made a point of occupying a hard-to-define middle ground between high and low brow. Off-White’s evolution has been both fast and pronounced, going from an off the cuff t-shirt label to an anticipated name showing at Paris Fashion Week in a matter of years. In 2013, Abloh, creative director of Kanye West, debuted his first label. Named Pyrex Vision, its main premise was screen printing logos onto Champion t-shirts and deadstock Ralph Lauren flannels, and despite the exorbitant price tags (the flannels sold for in excess of $500) it sold out, creating a platform and an audience for Abloh’s next step – Off-White. And while it could be argued that Abloh’s earlier Off-White collections caught the attention of some of the world’s premier retailers (Selfridges, Barneys, Matches) for reasons other than the collection’s nuanced design, the brand has developed not because of, but rather in spite of the hype which surrounds it. Of late, Abloh has evolved and improved as a designer – silhouettes have become more intriguing, leading to him eschewing some of the graphic-heavy garments that he perhaps over-relied upon in earlier collections – and, as a result, former critics have become fans. In many ways, this gradual acceptance of Off-White into the high fashion fold mimics a wider shift in attitudes. 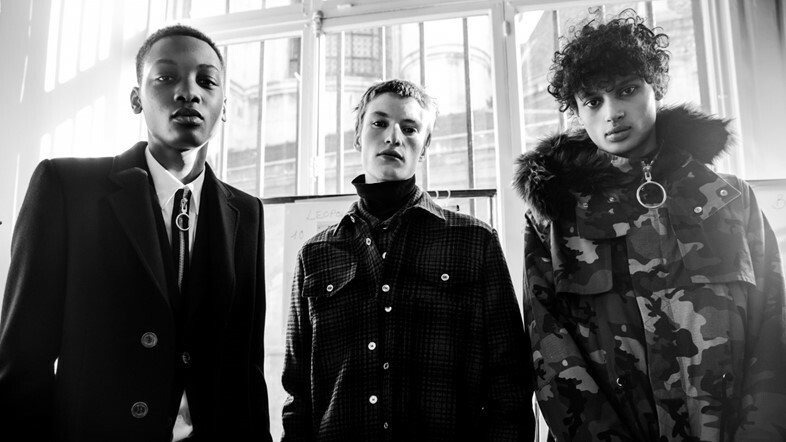 No longer is streetwear considered something to be looked down upon due to its often unashamedly brash nature and a perceived lack of innovative design beyond its striking graphic elements. That reductive attitude is something it has been actively rallying against in recent seasons, describing streetwear as more of a lifestyle than a sub-section of fashion: “It’s a thought, it’s also a construct,” he says. “Like, I could make a cup of coffee in a streetwear way: I would take a Folger’s cup (one of the largest coffee brands in America) and put Starbucks in it, do you know what I mean? Tom Sachs to me is like streetwear, it’s an art version of a kid who’s making a bootleg Chanel t-shirt. It’s the same thing, but one has a reference point.” To some, this might seem trivial – but it’s this hyper-conceptual attitude towards streetwear which has informed Abloh’s output at Off-White, where he is constantly seeking to juxtapose opposing worlds and thus create something unexpected. Throughout our conversation, Abloh makes reference to several artists and designers who he looks up to, from Sachs to Lucio Fontana whose slashed canvases inspired the previous day’s collection, and NYC skate polymath A-ron Bondaroff. He is someone whose discourse is punctuated by a diverse array of reference points, something which is inherently “streetwear” in itself – it is a culture that borrows heavily from other subcultures to define itself, be it 90s skaters, 60s Situationists or 70s post-punk design. 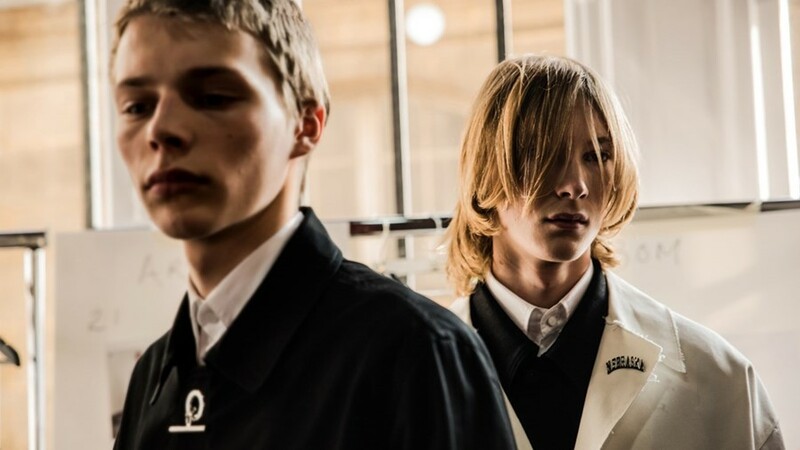 It was the latter which served as the opening gambit for the Off-White men’s show, playing an excerpt from Lou Stoppard’s SHOWStudio interview with Peter Saville, graphic designer and artist, whose seminal work for Factory Records defined the aesthetic of the post-punk era. The inclusion of Saville in the show seemed fitting as someone whose work has been referenced by everyone from Raf Simons to Supreme. That cross-section is seemingly where Abloh’s work sits – elevated beyond Supreme's exacting streetwear vision, but not quite scaling the heights of Simons’ vast and impressive oeuvre – and Saville’s practices of borrowing from various existing elements to create something new is not dissimilar to Abloh’s. Near the end of our conversation, Abloh excuses himself to check on the styling of his lookbook next door. His exit prompts me to look through any questions I am still to ask him. The only one left is the most clichéd end question of all interviews: “What next?” Some thirty minutes pass and I have to make a quiet exit for another meeting. What next for Off-White? I genuinely could not say – but somehow, that unpredictability in itself feels refreshing.